If you love the fizzy stuff then our Champagne & Sparkling Wine Tasting is ideal for you, especially if you have something to celebrate! We compare the real thing with other sparkling wines from around the world. Some are made using the same method as Champagne, so will you be able to tell them apart? You'll taste 6-7 sparkling wines, including Champagne, and enjoy one of the wines paired with chocolate. To finish the tasting everyone has a go at making a champagne cocktail. Fizz matched with a mystery chocolate! 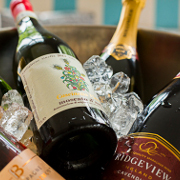 The £35 per person tasting has 1 Champagne and 5 sparkling wines to taste. In the £40 per person tasting you'll taste 2 Champagnes and 5 sparkling wines. In the £45 per person tasting, we taste 3 Champagnes, including a vintage Champagne and a pink Champagne, plus 4 sparkling wines. We regularly run Champagne & Sparkling Wine evenings in London at £39 per person including antipasti platters. You can book directly onto the evening by clicking the date below or purchase an open dated gift voucher for £39. If you have a £29 open dated gift voucher for our wine tasting and antipasti evenings you can use this voucher in part payment towards the Champagne & Sparkling Wine Tasting. Numbers are limited to 18 places. In addition to our Champagne and Sparkling wine tasting our One Day Wine Course and Discovery Day include sections looking at the different ways of making different styles of Sparkling wines including Prosecco and Traditional Method. We run these courses as part of a One Day wine course in Bristol, London, and Buckinghamshire or as a Weekend Wine Tasting Break in Warwickshire and Buckinghamshire. If you are looking for a much more in depth coverage you could consider our WSET Level 2 course which looks at the 4 different methods of making sparkling wines in much more depth as part of a much wider wien course. If you share our passion for the bubbly stuff check out what we have to say on the different aspects of Champagne and Sparkling wines by following this link to our Spotlight on Champagne and Sparkling Wine. To find out about booking and to check availability please contact us on 020 8288 0314 or email us. The Champagne tasting was great, we all had such a fun time!! Robert is awesome and we all got very merry but also learnt things we never knew about wine and champagne!! Myself and all of the girls would most definitely use ThirtyFifty again.